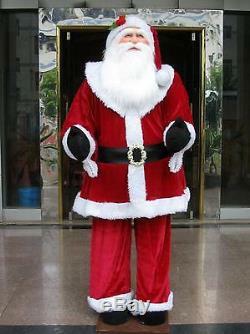 Huge 6 Foot Life-Size Decorative Plush Santa Claus - Sitting or Standing. If you miss Santa coming down the chimney to enjoy some warm milk and cookies, look no further. This life size Santa will make you feel like he is part of the family! Easy assembly required Plush parts connect with PVC poles to make Santa stand up or sit down Santa's feet are connected to a 16" x 16" display platform This is a display figure, it is not intended to be used as a toy Indoor use only. 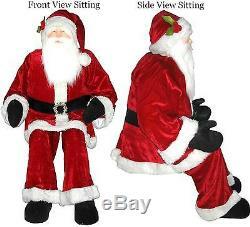 Note: Picture of sitting Santa is without the board attached to the feet but this listing is for a santa that has an attached board to the feet both sitting and standing. The item "Huge 6 Foot Life-Size Decorative Plush Santa Claus Sitting or Standing" is in sale since Tuesday, October 04, 2016. This item is in the category "Collectibles\Holiday & Seasonal\Christmas\ Current (1991-Now)\Other Current Christmas Décor". The seller is "christmascentral" and is located in Buffalo, New York. This item can be shipped to United States.